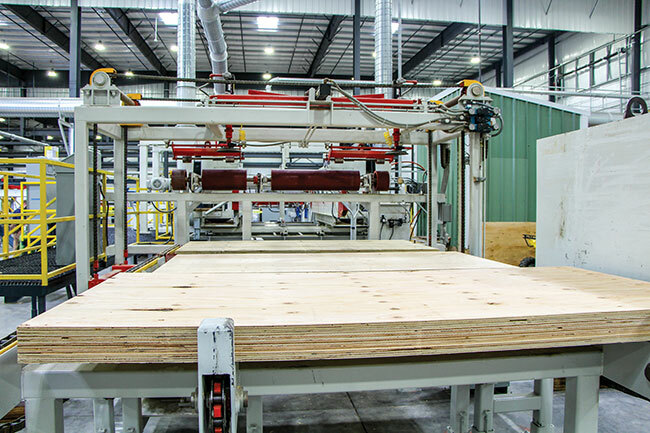 June 5, 2018 - Freres Lumber’s new $32-million mass plywood panel (MPP) plant in Lyons, Ore., is breaking new ground as it seeks opportunity in the growing mass timber component building movement and market. 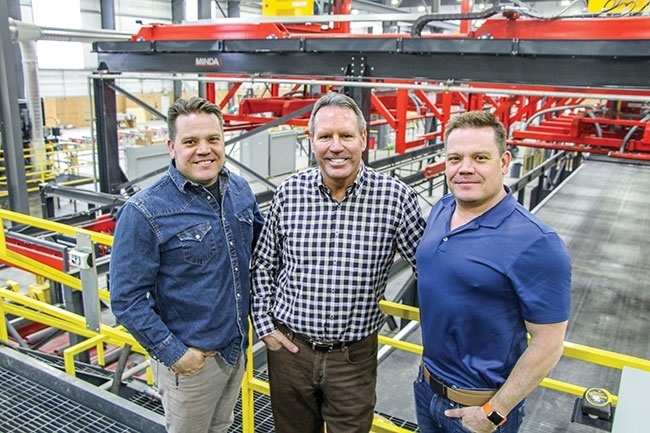 In doing so, the 20-year panel producer and 59-year veneer supplier is taking advantage of its longtime strengths while moving in a bold new direction. Freres Lumber’s new MPP plant started up in December 2017, and its MPP product is expected to receive certification under ASTM Standard D 5456 structural composite lumber products this month, and certification as a Mass Timber Panel under APA — The Engineered Wood Association’s APA/ANSI PRG-320 mass timber standard soon after. Introduced to cross-laminated timber (CLT) several years ago at an Oregon State University College of Forestry event, Rob Freres, Freres Lumber executive vice-president, says one of his first thoughts after seeing CLT was that “plywood is already cross-laminated.” Looking at the potential of CLT, Freres began thinking of ways to leverage his company’s veneer industry expertise in the developing mass timber building market. “It seemed like we could make a similar product using less wood fibre,” Freres says, noting that in developing strength properties, using material of various grades, he believes it’s more efficient to accommodate lower grade material by using veneer sheets instead of 13⁄8 in. lumber. “And the benefits of using veneer increase as the product gets thicker and bigger,” he adds. Researching a possible mass plywood panel product, Freres Lumber vice-president of sales Tyler Freres and his brother, vice-president of operations Kyle Freres, travelled to Europe in April 2015, visited some CLT manufacturers and kicked around some ideas. Back in the U.S., Tyler began working on some test panels with longtime plywood plant manager Jim Walker, who had recently retired. Some initial testing at the Freres plywood plant, using the existing press and making some 3 in. panels, proved quite positive, showing such a product would indeed outperform CLT, Freres says. By September 2015 they were taking test panels to the TECO lab in Eugene, and had filed a patent in October. Freres Lumber began testing MPP samples at OSU in January 2016 and had substantiated performance by March. In May 2016 they began ordering test equipment. While Tyler began the company’s initial MPP product development, Kyle and Tyler began pulling together test machines to explore product development and working closely with OSU’s Advanced Wood Products Lab to prove product viability. By late 2015 going into early 2016, the Freres R&D team had ordered a used 4×17 ft. test press and Hexion cold press resin with long open time to begin developing the product and samples for testing. 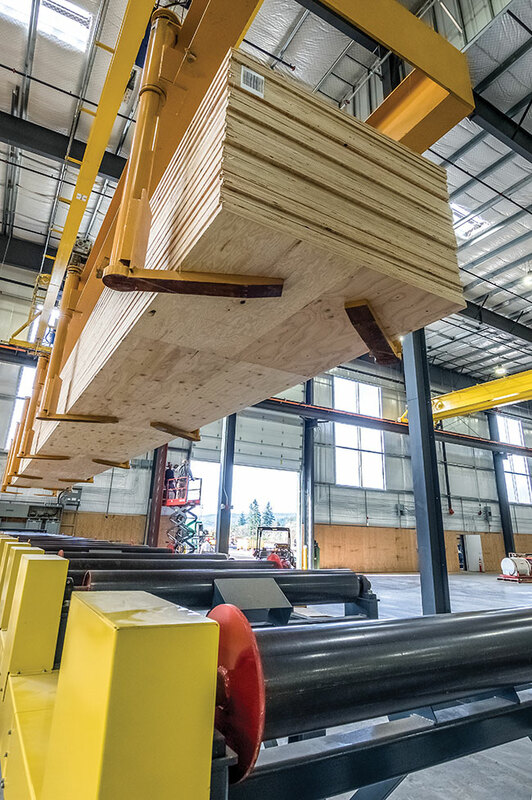 A big part of the process has been developing and executing the scarf joints that connect 4×8 structural composite lumber panels end-to-end. “We wanted to make sure that the means in which we joined the panels together was as strong as possible, so we settled on a structural scarf joint,” Tyler says, adding it has been a challenge since the joint can be difficult to produce in required quantities while also maintaining joint quality. When permitting issues kept Freres from locating the new MPP plant adjacent its existing plywood plant, the company decided to use a former mill property it owned roughly halfway between the pressing facility and veneer plant for the MPP project. Construction began in March 2017, and though the weather didn’t co-operate much, and site prep included extensive removal of log yard material while adding 76,000 yards of rock, the facility was ready to begin equipment installation by late August. The new plant is housed in a 320×560 building, plus covered loading-unloading areas outside. Inside, the production half of the plant features a heated floor that maintains temperatures for efficient resin handling, application and curing. 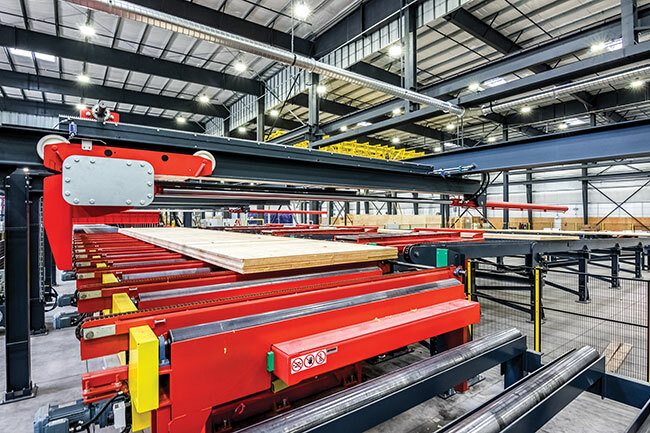 In talking with equipment vendors, the Freres team decided to go with Homag Group and Stiles Machinery, which reports 15 CLT plants under its belt and extensive experience with mass panels and supplied everything from the press area robotic sorter to the CNC system. Deal Manufacturing fabricated most of the material handling and transfer equipment. Local companies CD Redding Construction and North Santiam Paving Co. were the respective building and paving contractors, with Northside Electrical doing electrical work and West Coast Industrial supplying transfer equipment for the scarf line. At infeed, 4×8 panels categorized as structural composite lumber regardless of layup configuration and certified under ASTM D 5456 are initially processed through a double-end tenoner and glue applicator (Hexion MF resin). Panels receive scarf cuts and glue, and 481⁄2 ft. segments are fed through a two-track radio frequency curing press supplied by the Ogden Group. As 481⁄2 ft. billets, the mass panels flow down a long rollcase to a flying saw, are sawn and then lifted via a crane system to a work-in-progress area. All overhead gantry cranes and lift systems were supplied by US Crane. Joulin Vacuum Handling provided the vacuum gantries. A robotic sorter system executes the final panel layup per a pre-programmed product “recipe” and feeds the press. Custom designed by Minda, the TimberPress X 337 can produce panels up to 12 ft. x 481⁄2 ft. and up to 24 in. thick. Extensions and transfers can allow production and handling of up to 60 ft. panels. Press times range up to 130 minutes, and the press can handle multiple panels of different sizes simultaneously. Minda supplied the glue gantry and glue table, while SparTek Industries designed, manufactured and installed the glue head extrusion system. Press controls and the robotic layup system controls are from Aiken Controls. Off-loaded from the press, panels move by rollcase to the finishing side of the plant, where a Weinmann WMP five-axis CNC machine makes finishing cuts such as windows, doors and conduit channels, based on pre-loaded digital files provided by the customer that spec out wall and floor dimensions. He adds that in addition to being a natural evolution in the company’s veneer-based product line, MPP is also a way for Freres Lumber to diversify away from commodity markets while utilizing more of its LVL-quality veneer production in house. Like any sales manager who believes he’s offering a better alternative to other products on the market, Tyler cites the benefits MPP products have over CLT, beginning with an inherent advantage in flexibility based on each product’s basic building blocks. The basic CLT building block is a three-layer long-grain-cross-grain-long-grain layup of three roughly 13⁄8 in. pieces of lumber, and any increase in strength requires adding another layer of cross- and long-grain boards, leaving CLT married to a 3-5-7-9 layer system that has to be maintained regardless of strength requirements. By using 1⁄8 in. layers of veneer in building MPP products, panel strength can be more closely engineered to match required properties, he says. Less wood volume to meet the required strength values means lower cost, Tyler says: “Instead of paying for seven inches of wood to reach the same strength and values, you may pay for five inches of wood with MPP.” Freres Lumber made noise two years ago when it first announced the product would use “20 per cent to 30 per cent less wood” in the same applications as CLT. Tyler says the two products are more comparable in smaller thicknesses, but for applications requiring larger thicknesses MPP does get into that range of using almost 20 per cent less wood than the same product made of CLT. Another big advantage with MPP is raw material sourcing, Tyler adds, noting there are real constraints on the supply of high quality lumber that’s been going into CLT production. Meanwhile, MPP is built of veneer sheets that are all density graded, and can reach desired strength properties using a higher percentage of G3 and lower veneers, especially in thicker products, he says. So far, the plant has been producing mostly crane mats as its first products. While continually refining all processes, the company is sitting on go waiting for structural certifications expected this spring, after which they can publish product values and engineering tables. That’s when the MPP venture enters a new phase in the marketplace, and Rob says the company hasn’t had to go knocking on many doors or twist any arms to draw interest in the product. 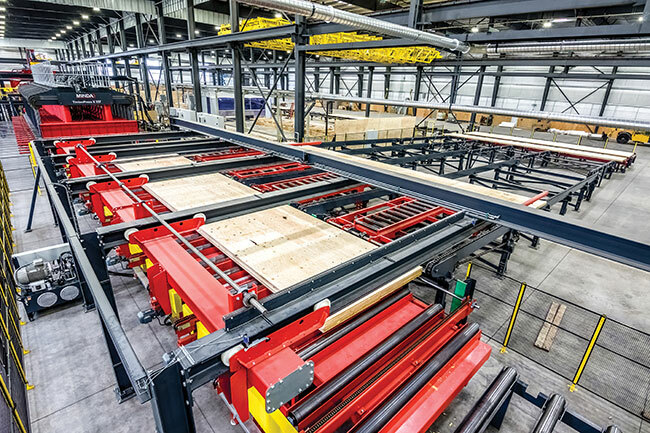 Another believer in Freres Lumber’s MPP is the U.S. Forest Service: Last year a grant proposal submitted by Freres won out over 114 proposal entries as the FS identified the MPP plant as its top wood utilization project. In doing so, the company was awarded a US$250,000 grant that went toward purchase of the CNC machine. And while the younger generation may be taking the lead with MPP, Tyler says his and Kyle’s father, Freres Lumber President Ted Freres, was “a strident and early supporter” of the MPP project, which would have never gotten off the ground without Ted’s support. He was involved from the very beginning advising on equipment and installation and design of the facility, and “His fingerprints are all over the production processes on the line,” Tyler says. Tyler also cites the support of all the company’s shareholders and their willingness to deploy capital aggressively in a way that many larger companies couldn’t (or wouldn’t) do: Proof of concept by March 2016, test facility operating by end of year, break ground on new plant in March 2017 and have it completed and started up by December. Special thanks to the Freres family, which sent additional photos. This article originally appeared in the March 2018 issue of Panel World and is reprinted with permission. Dust Safety Week 2018 is approaching!